New Delhi | January | 29, 2017 :: To Celebrate 68 Glorious years of Republic India The Tourism Ministry along with Defence Ministry, Government of India organised BHARAT PARV at Red Fort wherein Anuvrat Samiti Delhi was Invited to represent the state of Rajasthan. The Celebration which stretches from 26th to 31st January, on one hand showcases the rich and vibrant culture and traditions, cuisines and handicrafts of India and on the other hand local organisations from different states perform their folk music and folk dance along with performances of army,air force and navy. It is a matter of great pride and honour that Anuvrat Samiti Delhi got the opportunity to represent our very own state Rajasthan which is the birth place of both Anuvrat as well as its propounder Acharya Tulsi. Secretary Dr. Kusum Lunia’s powerful, Inspiring and Patriotic speech which was also being telecast live on National Television, left everyone spellbound . Oswal Youth Club with its team of youngsters performed a patriotic dance Sequence accompanied with stunts mesmerised the audience. Garima with her group of young,vibrant ladies performed on a parody of Rajasthani folk songs.The Great warriors of Rajasthan Maharana Pratap , Jhansi ki Rani , Bhamashah , Durgadas, Rani Padmini Hada Rani showcased their bravery and courage . Parody of Patriotic Songs with live orchestra was sung by eminent Rajasthani Singers -Chaitanya, Rakesh Chindalia and Sanjay Bhatera and it recreated a Patriotic Mood when they were joined on stage by Ratan Surana as Mahatma Gandhi, Sukhraj Sethia as Acharya Tulsi, Govind Bafna as Dr. Radhakrishnan, Dr.P.C.Jain as Dr. Ambedkar, Dr Dhanpat Lunia as Maharana Pratap , Satyapal Chawla as Bhairon Singh Shekhawat, ,Babulal Dugar as Dr Rajendra Prasad , Shantilal Patawari as Vallabh bhai Patel, Surendra Nahata as Jawaharlal Nehru, Dhanpat Nahata as Veer Durgadas, Vivek Borad as Subhash Chandra Bose, Sushil Rakhecha as G.D. Birla, Rajeev Mahnot as Bhamashah, Manish Maloo as Jagjit Singh and Vinay linga as Ram, Pramod Dugar as H. Ramakrishnan, Lalit Lunia as Bhagat Singh .With a huge round of applause the August gathering welcomed on stage – Rani Padmini depicted by Dr.Kusum lunia, Dr. Hansa Sancheti as Rani Jodha, Jaya Rakhecha as Jhansi ki Rani, Vijaylakshmi Sharma as Mira, Nisha Agarwal as Panna, Rakhi Ranka as Sita and Prem Sethia as Bharat Mata . 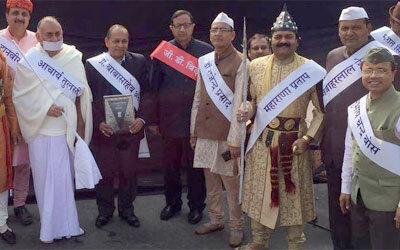 They carried Placards which depicted the 11 Code of Conduct of Anuvrat . With support of Gov of India, Gov of Rajasthan, GN Batt Smt Nivedita Lunia also provided the technical support . It was a privilege for Anuvrat Samiti to be a part of this Historic Event and Team Anuvrat performed with full dedication and enthusiasm. All in All the feeling of patriotism was high throughout the event which is also why Bharat Parv is being celebrated in such a grand way. Bharat Parv, a national festival showcasing the countrys diverse culture, cuisines, handicrafts and catch glimpses of a progressive India was inaugurated by Dr. Mahesh Sharma, Minister of State (Independent charge) for Tourism and Culture at Red Fort, Delhi. Bharat Parv event is being organized by the Government of India at the Red Fort, Delhi from 26th to 31st January 2017, as part of the Republic Day 2017 Celebrations. The prime objective of organizing the event is to generate a patriotic mood, promote the rich cultural diversity of the country, ensure wider participation of the general public and to popularise the idea of Ek Bharat Shreshta Bharat”. International Women’s Day : “Time is Now : Rural and urban activists transforming women’s lives”. Launching of Exide SF Home UPS System in Ranchi.